at Verizon Theatre Feb 20-23rd, 2014! This is a brand new Sesame Street show. 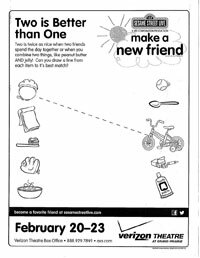 No matter where you’re from or where you’ve been, everyone is special – so join in! 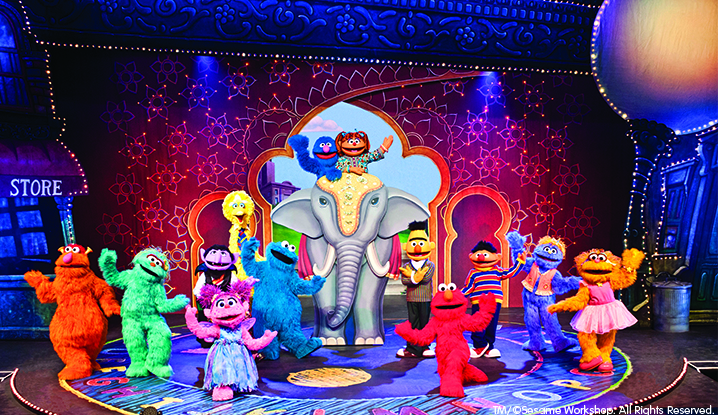 Elmo, Grover, Abby Cadabby, and their Sesame Street friends welcome Chamki, Grover’s friend from India, to Sesame Street. 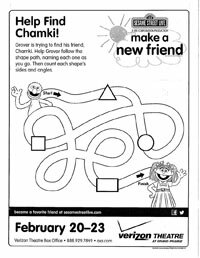 Together, they explore the universal fun of friendship and celebrate cultural similarities, from singing and dancing, to sharing cookies! Join the fun and make a memory with your friends and family! 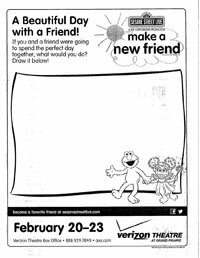 Do you want to win 4 tickets to see Sesame Street Live’s NEW Show, Make a New Friend? 2. Follow North Texas Kids on Twitter and Tweet about this contest. Be sure to add @northtxkids to your tweet. Just click on the twitter icon below this post. 3. Follow North Texas Kids on Facebook. Share about this contest on your Facebook page. Be sure to share it as a public post so we can see it on our page. Just click on the Facebook icon below this post. 4. Subscribe to our eNews by signing up below (only applies to new subscribers who don’t currently receive our eNews). Don’t forget to leave a link in your comment below to wherever you have shared about this contest (Pin, Tweet, FB Share). Contest ends Friday, Feb 10th at midnight CST. Winner will be notified by email. The email address you use in your comment below is the one we’ll use to notify you. I love that you have all these contests! Who doesn’t love contests. I shared on facebook and hope to win! I have twin boys that turn 6 on the Feb 8th and they would LOVE to see Sesame Street Live. Elmo is one of their favs and Cookie Monster is the others!! Got my fingers crossed for the win!!! Have an awesome day! My 3 yr old twin girls absolutely love Elmo!! Shared on FB and tweeted on twitter. My kid loves big bird. Liked and shared on Facebook. Thanks to everyone so far who has participated. A few entries don’t seem to be following the instructions. Be sure to read these closely so your entry is eligible for this contest. Thanks! We would love to win tickets! My son’s favorite character is Elmo! Followed North Texas Kids on Facebook. My daughter loves Cookie Monster…. Ok my whole family loves him too… Would love to,have a family fun day with Sesame Street… Yay 4 free tickets.. Fingers crossed . Thanks ! My daughter would love to see Elmo! My niece’s favorite character is Elmo! I shared on Facbeook. Thanks! Hope to win these tickets! My daughter loves Abby! Shared on pinterest! My son loves Big Bird so I really hope we get to see him! Thanks! http://www.pinterest.com/pin/286400857527384517/ is where I put it on Pinterest. Elmo is my daughters favorite character. Elmo is my daughters favorite character. My son is 12 years old, happens to have autism, and really LOVES Count Von Count! He knows Jerry Nelson died in 2012 (original voice of Count Von Count) and Matt Vogel is the new Count Von Count. If we won tickets to see Sesame Street Live, he would be over the moon! My 1-1/2 year old LOVES Elmo! This would make his day!! Already a Pinterest follower and a FB follower! My lil girl loves Elmo. My son’s favorite character is Elmo! I shared the contest on Facebook! Hello NTK!!!! I pinned on Pintrest and followed and shared you on Facebook. Our Favorite character is ELMO…of course AND Abby!!!! Oh I’m sorry…I don’t know how it include the link but my Pintrest and Facebook name is LaTasha Wilson Drain..hope u can find me on BOTH!!! My almost 4 yr old loves Abby! I am following on Pinterest and pinned the giveaway link. My 3 year old daughter, Brooklyn, LOVES Abby Cadabby! 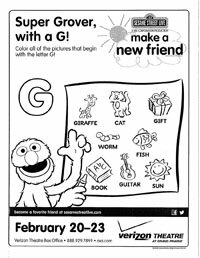 Congratulations to Amy V. and Elizabeth H. for winning the Sesame Street Live tickets! Thanks for participating everyone!